What else can you make with an orange plaid shirt found at Good Will? 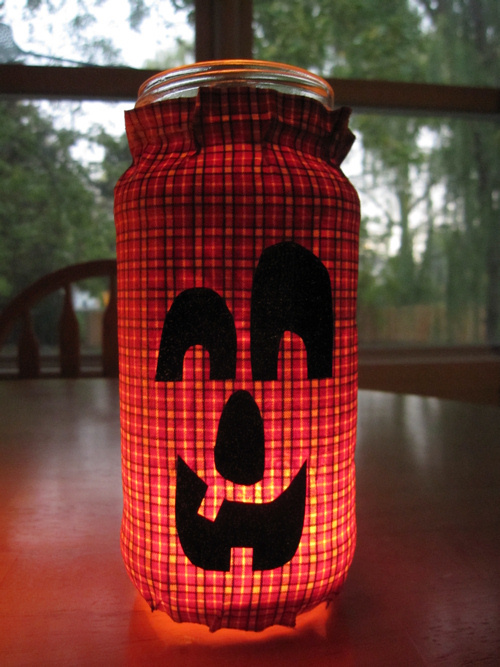 Why, make a Jack o’ lantern jar, of course! I used material from this plaid shirt for my scarecrow costume, and since the shirt had a lot more material left, wanted to try to make something else Halloween-y with it. Way back in September, Judy from What I Live For made some adorable Jack o’ lantern jars with orange fabric, and I really wanted to make some! So I saved some jars, washed them out, and there they sat, on my kitchen counter, for days. I didn’t have orange fabric or tissue paper. 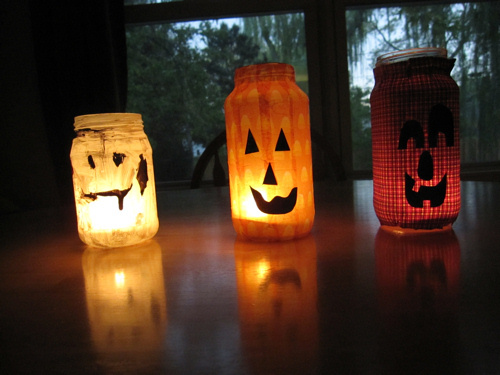 I finally got tired of the jars sitting on my counter, so I threw them in the recycling bin, thinking I was never going to make the Jack o’ lanterns anyway. But then a couple of days later, I had a change of heart and dug them out again. Thank goodness I changed my mind before the jars made it to the curb! Emmy and I sat down one afternoon last week, and made three different jars. 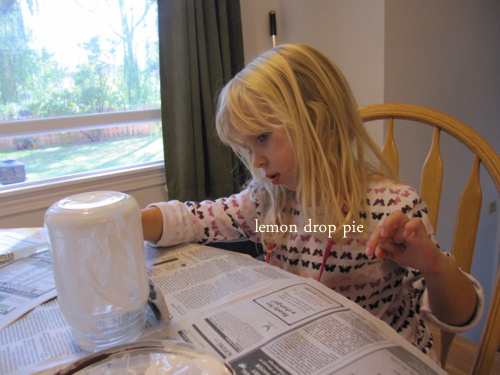 Emmy used paint, and made a ghostly jar. From orange tissue paper that was in a gift I received, I made the middle Jack o’ lantern, and the plaid shirt was turned into the lantern on the right. What’s her mommy thinking, letting her paint without a smock? I used Mod Podge to glue the fabric onto my jars, and I found some glittery black paper in my scrapbooking supplies for the eyes, nose and mouth. I put a tea light at the bottom of the jars and Voila! 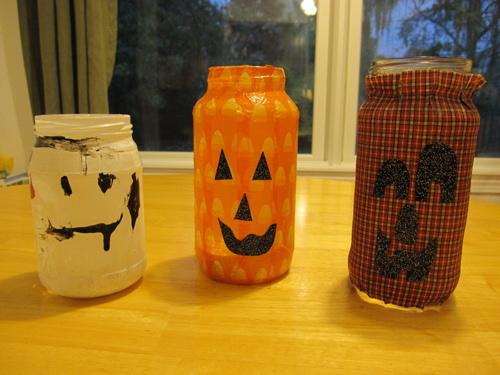 A ghosty jar and two Jack o’ lantern jars! The plaid fabric is a touch too thick for this project; I think the orange tissue paper I used in the middle jar looks much nicer. There are two more empty jars waiting for Lily to make her Jack o’ lantern jar. They are going to look so cute, lit up on Halloween night! LOVE! Your creative juices are really flowing this season! I think Emmy's jar looks the scariest by far. It's as if the gore is still dripping from its mouth. Creepy…Since we don't celebrate Hallowe'en in the Netherlands, the only thing I did was put my orange monster in a pumpkin suit. Not sure he liked it though. That looks like such a fun project! The jars are adorable, too! I'm glad you had a change of heart! They came out so cute. What a fun project for kids and adults! Well we have our candy. Hopefully we will get a pumpkin tomorrow. Those are SO cute! I love the ghost, and the plaid pumpkin especially :). Thanks so much for stopping by and telling me about your jars!